This article originally appeared on the Energy Trust of Oregon Insider blog. In January, Energy Trust will launch a solar marketing training series as part of our ongoing work to reduce soft costs in Oregon. A key aspect of solar customer acquisition soft costs, marketing is a promising area for business development. The training series will be facilitated by Glenna Wiseman of Identity3, a nationally recognized solar marketing expert. 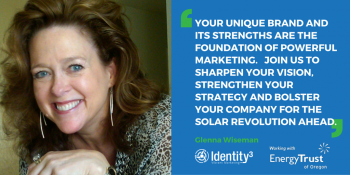 Through Identity3, Glenna has worked with solar installation firms on website, client persona development and marketing strategies. As the vice president of marketing for HelioPower, she created the company’s first marketing department and led it for five years. Prior to HelioPower, she co-founded an integration company in residential construction, called Home Tech Works, where she worked with hundreds of homeowners directly. Glenna is a recognized writer and speaker within the industry, covering a wide range of topics. Wiseman co-created “Shining a Solar Marketing Light on Women,” the industry’s first women oriented survey. She has contributed to industry publications and talk show formats, co-hosted the popular SolarChat series and been a featured speaker at Solar Power International. Glenna is a member of Women in Solar Energy, WISE. Read her HeatSpring “Women in Solar Summer Series” interview here. The marketing training series will begin in January 2016. The intent is to tackle subjects with the widest appeal for Energy Trust trade allies and the highest business development potential impact. The program objective is to help trade allies become as efficient and effective with their marketing initiatives as possible while expanding the foundation of their organizational reach for future growth. If you have any questions or would like to suggest a topic, contact Glenna Wiseman.